If late summer and autumn allergies—known as “hay fever”—affect you, you are not alone! Millions of Americans suffer from seasonal runny nose and itchy, watery eyes. 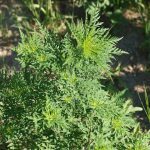 Much of this allergic reaction is blamed on goldenrod and ragweed, when, in fact, only ragweed spreads irritating pollen—goldenrod does not! Goldenrods (Solidago spp.) 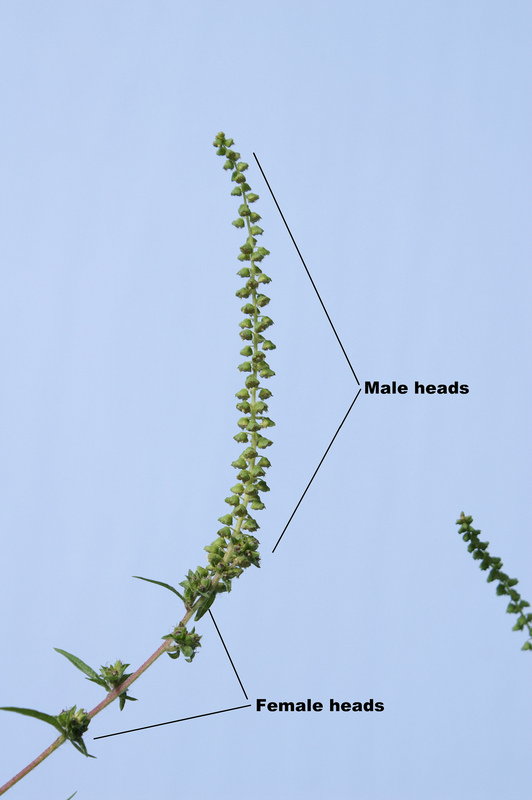 and ragweed (Ambrosia spp.) 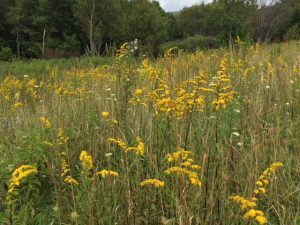 mature in late summer; but the showier goldenrod is insect-pollinated, not wind-pollinated and that’s what makes the difference. Ragweeds are annual native weeds found in cultivated areas, as well as along roadsides and meadows in heavy soils. 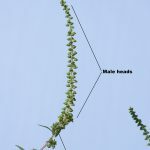 In early spring, common ragweed’s (A. artemisiifolia) first leaves are opposite but become more deeply dissected and arranged alternately as the plant matures. It can grow to 4 feet tall. It produces only inconspicuous flowers of nondescript color, but in early autumn, breezes distribute clouds of allergy-causing pollen as we seek to enjoy the late summer and early autumn. If you learn to recognize its leaves, it is easy pull any time before it flowers, and mowing will keep it under control—you will be shearing off any flower stalks before they bloom. 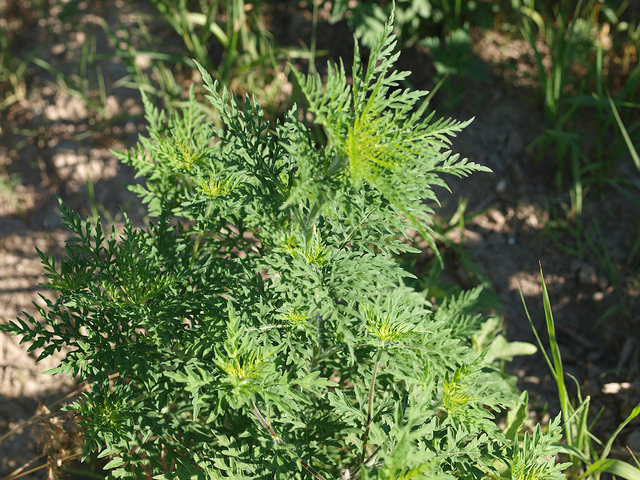 Note that we also have giant ragweed (A. trifida) in our area that also produces irritating pollen. 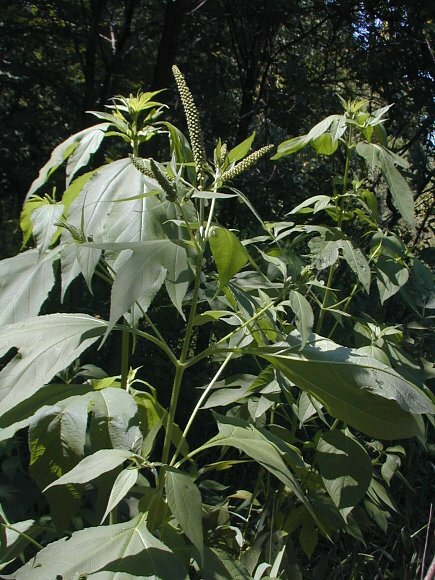 It is much taller—up to 16 feet!—and has opposite leaves with 3 to 5 large lobes and flowers much like common ragweed. 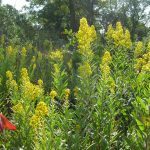 Welcome goldenrod to your garden! Goldenrod is a native herbaceous perennial in the aster or Asteraceae family that presents dazzling displays of brilliant yellow flowers in open meadows and roadsides. These bright yellow flowers hold sticky pollen that attract bees, butterflies, and other insects until early frost. 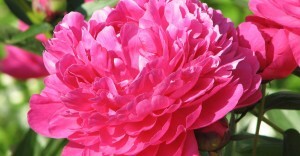 As the floral display matures, birds flock onto upright stems to enjoy the seeds. They range in size from little more than 12 inches to 6 feet tall. Some spread aggressively, while others form well-behaved clumps. 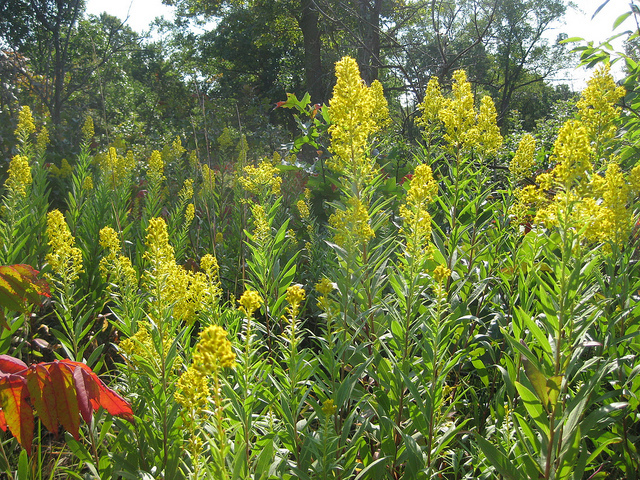 In addition to soft plumes, goldenrods’ yellow flowers can be spiky or even zig-zagged! 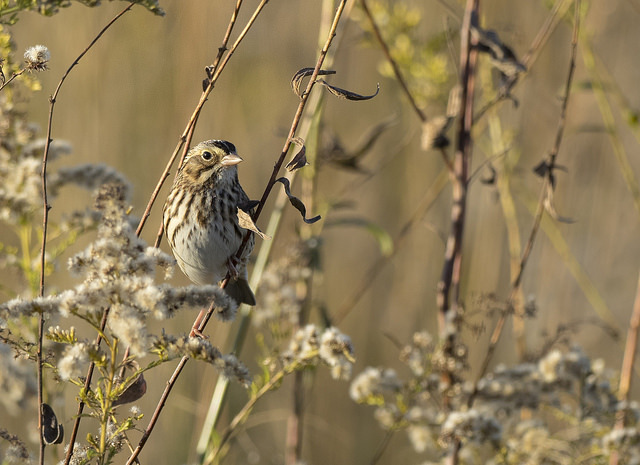 There are species adapted to many habitats, from salt marshes, to swamps, prairies and woodlands. 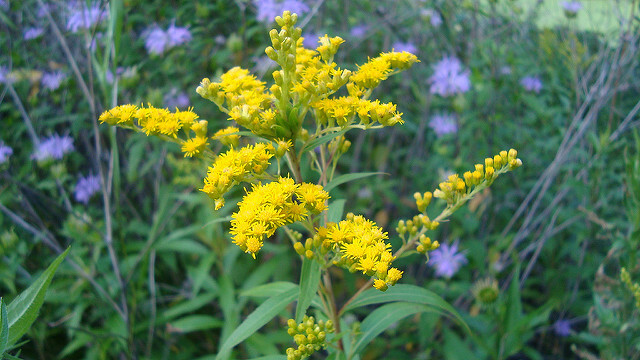 Early goldenrod (Solidago juncea) starts blooming in July and is drought-tolerant. 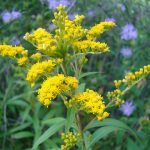 Sweet goldenrod (Solidago odora) has anise-scented shiny leaves, reaches only about 2 to 3 feet tall and has a well-behaved clumping habit. Common goldenrod (Solidago altissima altissima also known as Solidago canadensis var. 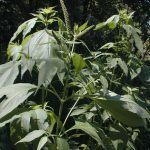 scabra) is a tall (up to 6 feet) plant that spreads aggressively by underground rhizomes, which can be an advantage in controlling erosion, even on steep slopes. Goldenrods are subject to very few diseases, and although you may see some galls, spider mites and lace bugs, deer typically ignore them. 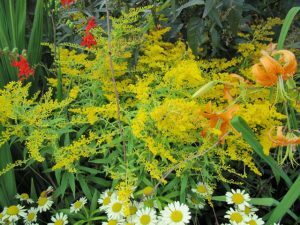 So, as September arrives, bringing the first falling leaves, hints of coolness in the air, and breezes carrying pollen, don’t be concerned about goldenrod. It’s a harmless beauty! Avoid hanging laundry to dry outside. Hire someone to mow the lawn during late summer. Keep bedroom windows closed at night. Stay indoors on windy days and at peak pollen hours—early morning and late afternoon. 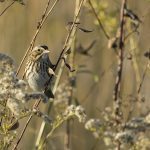 While these suggestions can certainly help allergy sufferers cope, one final thing we can do to lift our spirits as we gaze outdoors or ride along is to take time to enjoy the goldenrods! Read about different types of goldenrod, from the wildflower to cultivars for the garden.